Plants have a number of foes or enemies and we humans are on the top of this list. Most of us do not think before we cause damage to plants, whether in and around our houses or in a park. While we do it mostly out of habit, there are some other animals and insects, who, out of necessity, cause damage to plants. A many of these animals and insects feed on the plants, causing minor to substantial damage and thus, we may categorize them as the enemies of plants. I will cover some of these enemies, I've come across in my container garden, over a period of time. I have documented the presence of these insects, larvae etc. There are no animals, because, no animal can climb over to my roof without me letting this happen, except some cats. Ever since I started gardening, every now and then I used to come across some white irregular lines that appeared in some of my plants, more prominently some tomato leaves, marigolds, leaves of beans, pumpkins and the gourd. Most of the times, I removed off such leaves from the plant, and I burned these affected leaves, fearing the thing to spread to the other leaves and plants too. This time around, I let the white serpentine lines spread in a few leaves of my broad beans plant, when it first appear. I didn't remove the affected leaves, just to check out what this causes to the leaves. I've carefully clicked some shots at different stages of the interaction of the leaf and leaf miner. This also let me understand how disastrous this invasion of a leaf miner, - a harmless looking white line within the leaf could be. 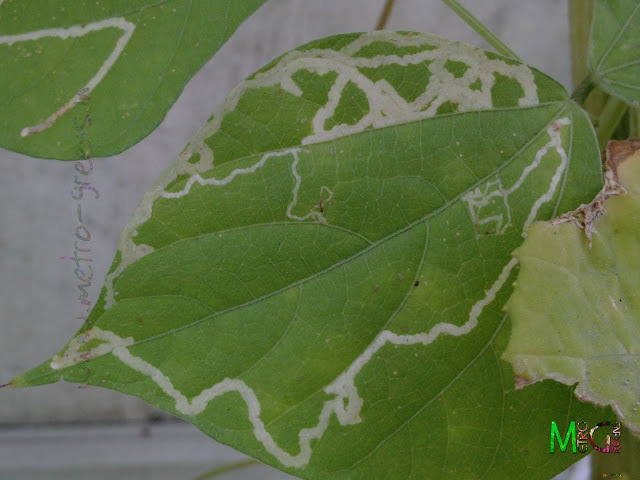 An image of a leaf miner infested leaf of broad beans vine, I took when I first noticed the consequences of it infesting the leaves of my plants. 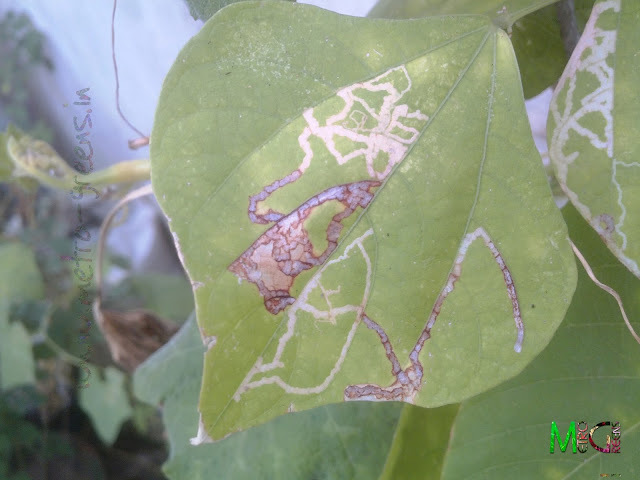 Image of another leaf miner infested leaf of broad beans vine, I took when I first noticed the consequences of it infesting the leaves of my plants. Within weeks, of its first appearence within the leaf, this white line turned brown, and the leaf also started turning brown. This was a clear indication to me that this leaf miner invasion is no harmless plant-insect interaction, but, a harmful one for the plant. The worst part is, there is nothing I could do to remove the insect larva inside the leaf as it is sitting within the protective layers of the leaf, so whatever insecticide or pesticide I spray on the plant leaf would go in vain, as it won't reach in the insides of the leaf. So, the only option left with me was to remove the infected leaves, and burn them, so that the larva inside gets killed and I could get rid on one insect to deal with. This is still a better alternative, as the leaf miner larva would ultimately feed on the leaf, and would kill it, so, removing the infected leaf is the best option, and I did this. An image of the leaf miner infested leaf of broad beans vine, I took around a week of noticing the infestation first on the leaf. 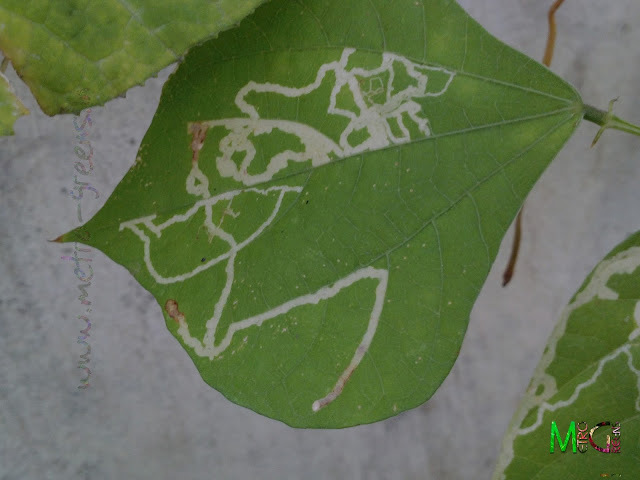 This shot shows the spread of the dead leaf tissues along the trails of the leaf miner, along with a slight change in the colour of the white trail. Another image of the same leaf miner infested leaf of broad beans vine. This image was taken around about three weeks after I first noticed the infestation. This shot shows the spread of the dead leaf tissues along the trails of the leaf miner. This shot clearly shows the spread of dead leaf tissues over a large part of the infested leaf, along the trails of the leaf miner. Finally, I removed all the infested leaves from the plant. 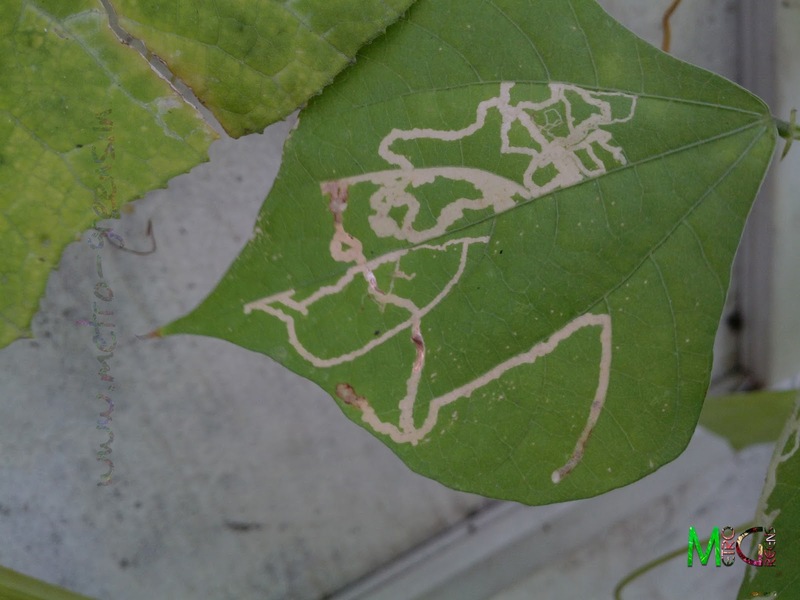 A lot of leaves had started dying as a result of the infestation of the leaf miner larvae. I made sure that the leaves I remove be burned along with some other harmful stuff I removed from my other plants. I will discuss the other such stuff in the upcoming posts. I have information on of some harmful insect larvae, aphids, white mealybugs, etc to share with you all. Till then, keep visiting and HAPPY GARDENING!